"A comprehensive course based on spaced repetition." Living Language promises to teach students how to speak, read and write contemporary spoken Russian. It is based on the language teaching approach developed by the US Department of State to teach its diplomats before they head to Moscow or St. Petersburg. I wanted to see for myself whether Living Language Russian online was really as effective as the marketing materials claimed. Below you will find the results of my experience with this language course. Included in the review is a overview of materials contained in the course as well is its major pros and cons. I have included a comparison with some other popular Russian language learning courses so that you can decide which is the best option for you. At the end of this review I'll provide an overall recommendation and conclusion. The online course costs $150. This gives you access to the same material as is included in the platinum Russian course, but in a digital format. The program includes 46 Russian language lessons cover grammar, vocabulary, conversations, and culture. The course provides access to an online tutor with whom you you practice your Russian conversation and review the language lessons. As a subscriber you have access to the online community which includes other students and Russian language experts. In addition there are games and puzzles to help you with your Russian study. Costs less than other similar courses - compared to other Russian language courses on the market such as Rosetta Stone and Pimsleur, Living Language offers excellent value for money. It's a very comprehensive course that easily matches other more expensive language courses. Easy to learn on the go - the downloadable MP3 files can be added to any MP3 player. This makes it easy to learn Russian wherever you are. I enjoyed listening to the audio lessons while doing chores and going for a stroll in the evening. The audio approach means that you don't have to sit down in front of a computer in order to progress with the material. Very good progress in reading and writing Russian - two major strengths are the reading and writing teaching materials. While mastering the Russian language takes some work, if you follow the material, you will make good progress. Requires frequent practice - The online course can help you to gain a good intermediate ability in Russian. But if you simply want to learn a few conversational phrases, this may not be the course for you. To get the most out of the program you need to devote a good amount of time to practicing the material. It requires a repetitive approach to study which will not be for everyone. Stories can be boring - Living Language uses stories for reading practice. Unfortunately, most of them are not very engaging and can become boring very quickly. One improvement for this course would be to use more interesting stories. Important information is included in the summaries - Important information is often included in the summaries at the end of the course. This means that studying the summaries is important if you are to grasp the main grammar and vocabulary concepts covered. It would make more sense to include this information in the main part of the course. Doesn't record progress inside the lessons - Until you can fully complete a lesson the progress marker doesn't record it as being finished. In addition, it's not always clear what you need to fully complete a lesson. I occasionally found this frustrating as it appeared that I had completed all of the material but it was not yet marked as being completed. 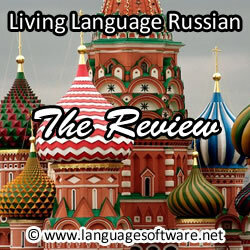 Having tried Rosetta Stone Russian (my review) as well I can say that they're almost identical. One of the major selling points of it is the ability to hold an interactive conversation using your computer and microphone. But the speech recognition with Rosetta Stone is good too, so this feature doesn't actually make it stand out in comparison. Another popular Russian language course comes from Pimsleur (my review). However, Pimsleur is a lot more expensive; for the full comprehensive level 1 to 3 course you can expect to pay $650. Despite the high price tag Pimsleur doesn't include many of the materials that come with Platinum Edition of Living Language. It's also far better at teaching the Russian alphabet and how to read and write. Lastly, the most serious competitor is Transparent Russian (my review), which is currently available for $179.95 with access to the online course. Transparent Russian has many features that you'll get with Living Language Russian, including fully interactive lessons, quizzes, games, vocabulary, and grammar lessons, but has a slightly more interactive and modern feel to it. The MP3 audios make it easy for learning on the go. Good reading and writing study materials. The price is fair considering the comprehensiveness. The repetitive approach requires even more frequent practice. Instructional stories can be boring. Overall Living Language offers a decent and comprehensive course to learn Russian. At $150 for the complete online course it offers very good value for money compared to other Russian language courses. In my opinion Living Language Russian is a superior course to the Rosetta Stone Russian course. It also teaches reading and writing Russian far better than Pimsleur. The only course that I would recommend over is Transparent Russian. Online access to the Transparent Russian course currently costs about the same as what Living Language charges. But Transparent Russian provides much of the same material and so, in my opinion, is the superior course. Living Language Russian at times suffers from being a little dry and academic for my taste, but is overall a high quality course.